Dr. Jerry "Todd" McClaran was born and raised here in Cape Coral, FL. His father, Dr. C.E. McClaran, established one of the first dental practices in Cape Coral in 1972. "I grew up seeing how much my Dad loved practicing dentistry and as long as I could remember I wanted to follow in his footsteps." Dentistry has become somewhat of a McClaran family tradition. Dr. Scott McClaran has a striving dental practice in Fort Myers. "I am very proud of my brother; he is a great dentist and he has a beautiful practice. Our wives can testify that family gatherings can, on occasion, turn into a dental symposium... Dentists love to talk about teeth." 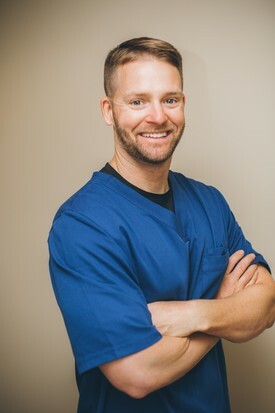 Following his 3 years of service in the Air Force, Dr. McClaran, his wife, Nona, and then 1 year old daughter Dakotah moved back to Cape Coral. "I really enjoyed my time in the Air Force. I was fortunate to be mentored by some great Air Force dentists during the residency program, and I gained a ton of valuable experience. When my service commitment ended, my wife and I were very excited to move back to Florida. I love the Cape, it is my home. I couldn't wait to get back to our family, the great weather, the water, and fishing." For Dr. McClaran, the highlight of practicing dentistry is the immediate positive results of the work. “Whether it is fillings, crowns, veneers, or root canals, the positive results are immediate. That is one of the greatest things about dentistry. For example, if a patient has a toothache, using the most up-to-date dental treatment, most times that patient will leave the office and immediately feel the improvement. Or, a patient who has not been able to smile in years due to insecurities of broken or discolored teeth, after just a few appointments, they are smiling again with confidence." A huge point of emphasis with Dr. McClaran and his staff is treating our patients as if they were family. "I am very fortunate to have such a great staff. They bring years of dental experience to the table. Simply put, at Family Dental Care we want everyone to have the same level of care we would give our parents, sisters or brothers, sons and daughters.” Another area importance is patient education. "My job is to provide as much information as possible and help patients make an educated decision regarding their oral health.” Dr. McClaran stays up-to-date with the latest research, technology and techniques to improve patient confidence and comfort. "When first visiting our office, it is all about building confidence and addressing a patient's chief concerns. We want people to come in, see our office, and talk to the staff and me. We encourage our patients to ask a lot of questions and make a well informed decision about their dental health."